Sword of Saint Maurice is 43 inches in all with a 37 ¼ inch hand forged high carbon steel blade. 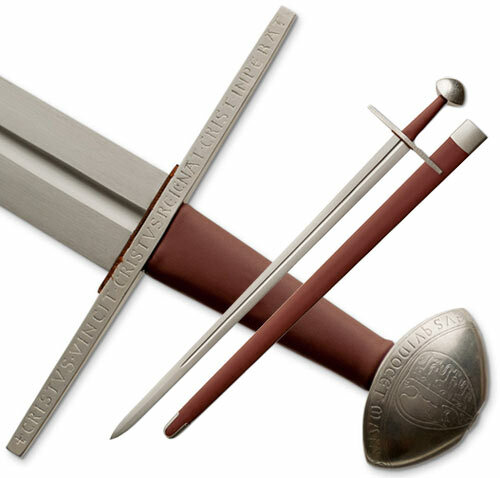 These swords are inspired by a real medieval sword from the late 11th to early 12th century that honored the patron saint of soldiers, armies, swordsmiths and infantrymen. These slender single hand swords have a modified Oakeshott's Type XI design with a longer blade and thin fuller. The 3 ¾ inch handle is topped by a pommel that is engraved with the Coat of Arms of the Roman Empire, an eagle crest on one side. The reverse side of the pommel features the personal arms of Otto IV (1198-1218). The guard is intricately engraved with 'CHRISTUS VINCIT, CHRISTUS REINAT, CHRISTUS INPERAT' (Christ Conquers, Christ Rules, Christ Emperor). They have a point of balance at 7 inches, point of harmonics at 25 inches and weigh 2 pounds 13 ounces. They include a solid wooden core scabbard. Buy The Sword of Saint Maurice for $419.99.